One goal for the University of Washington, School of Medicine, Center for Health Equity, Diversity, and Inclusion (CEDI) is to increase faculty diversity in the UWSOM. 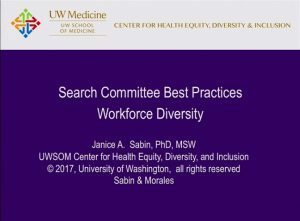 We have developed a presentation for search committees with the goal of increasing faculty diversity in the UWSOM, titled: Search Committee Best Practices: Diversity = Excellence. 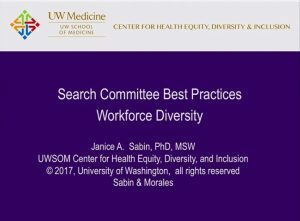 The presentation highlights the need to increase diversity, best/effective practices to promote diversity, how unconscious bias affects workforce diversity, and ways to mitigate the effects of unconscious bias in resident/faculty search and promotion. The presentation will help guide your committee to conduct an inclusive search. Please contact Dr. Janice Sabin to arrange a time for your search committee to participate in this training. If you have expertise in this area and would like to give this presentation to your search committee or, if you would like to be trained to give this presentation, please contact Dr. Janice Sabin.